I like happy things. This salad is a happy salad – it’s colourful, full of unexpected flavour, nutritious, and fast. What’s not to love? It’s bright and cheerful, just like my pal Jerrica who introduced me to this salad (and yes she is named after this gal). Beets are so pretty, especially these candy cane and golden beets from my local market. Same goes for these purple and orange carrots. You can make this salad with normal beets and carrots, but these fancy ones happened to be available and well, I’m a sucker for pretty produce. I was a little apprehensive when I first saw this original recipe for the salad dressing. 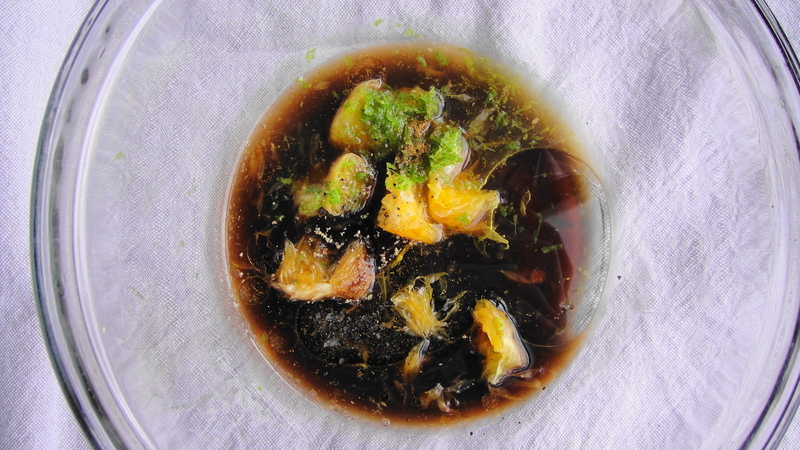 Orange, balsamic vinegar, cumin, and lime zest? Together? Definitely out of my comfort zone. But I trusted Jerricas recommendation and figured she wouldn’t steer me wrong. And of course, she was right. It turned out absolutely delicious. I loved every single bite. Not only was this salad super fast to whip up, it was E.A.S.Y. And satisfying too. It’s fancy enough to entertain with and filling enough for a light lunch. 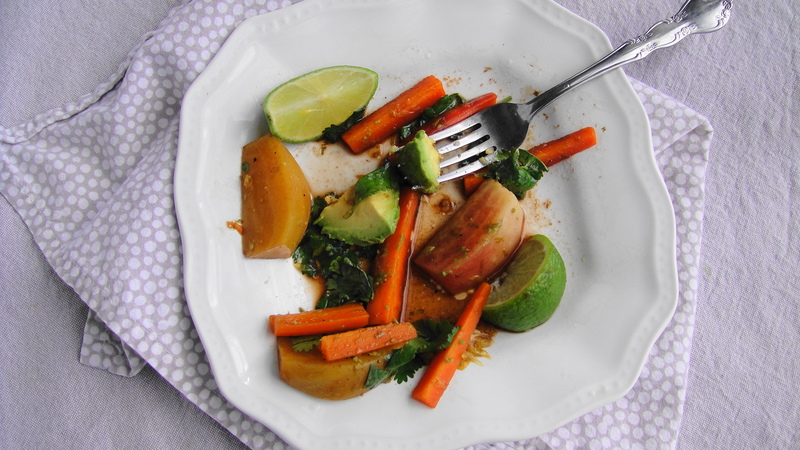 The avocado was nice and creamy against the crisp of the carrots and beets. The cilantro leaves added extra freshness and complemented the nicely balanced flavours of the dressing. Now be warned, the balsamic turned the avocado a bit brown. Don’t be scared. It really adds amazing flavour and I wouldn’t substitute for a lighter vinegar just for aesthetics. Taste trumps pretty sometimes. Overall, this salad is colourful, unexpected, and delightful, just like the gal who introduced me to it. Bring a medium saucepan filled halfway with water to boil. Add carrots and beets and simmer for 8 to 10 minutes or until beets are tender enough to be pierced with a fork. Drain and set aside. While beets and carrots are cooking, prepare dressing. Combine all the dressing ingredients in a medium bowl and whisk together. 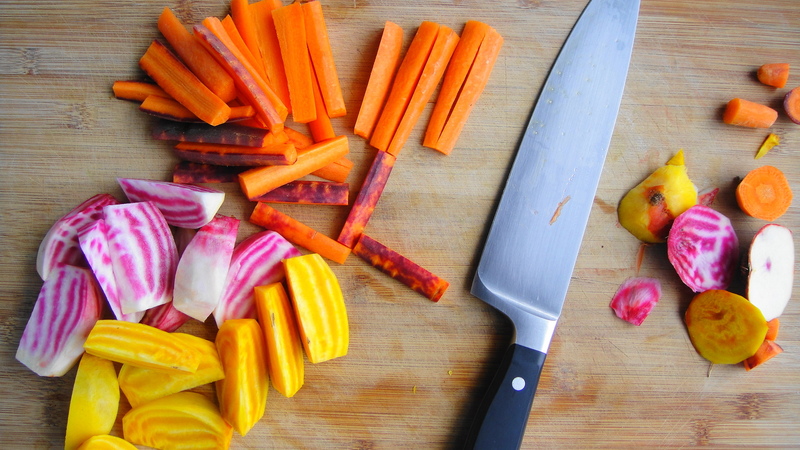 Add cooked and drained carrots and beets to dressing while they are still warm. Add fresh cilantro leaves and toss together to combine. 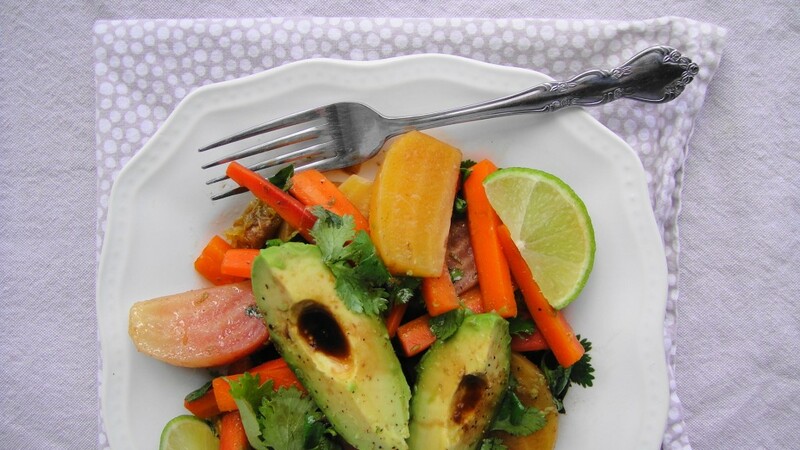 Using a tong or slotted spoon, scoop out beets, carrots and cilantro and place on serving dish(es). 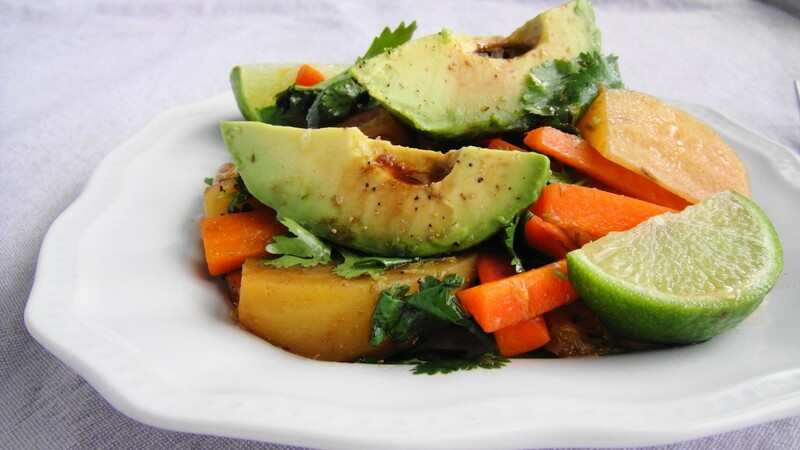 Add quartered avocado to the remaining dressing in mixing bowl and gently spoon dressing over the avocados. 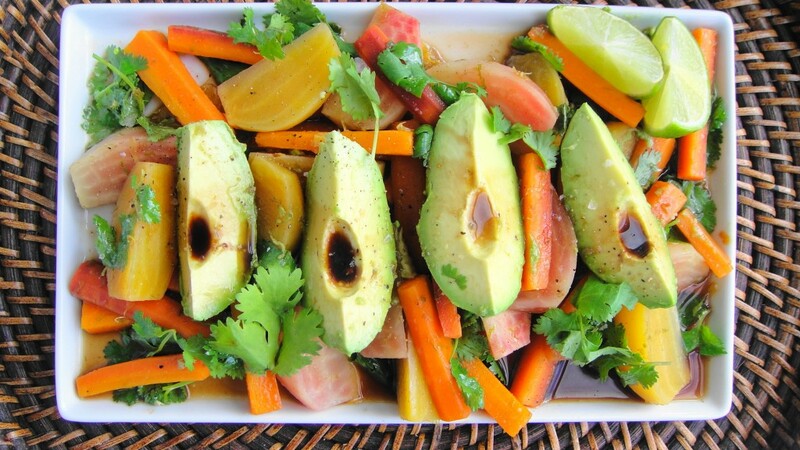 Gently place avocados on top of plated beets and carrots and spoon any remaining dressing over the avocado. Drizzle with extra balsamic and serve immediately. Recipe Note: If you use normal beets and carrots and boil them together, the beets will turn the carrots pink. If this isnèt your thing, you can boil the beets and carrots separately.